This trail looks to be a trail of many firsts…yesterday was my first slack pack and today we are taking a zero after doing just 4mi/6km to start the trail yesterday. An odd beginning, but fitting and relaxing in a way. It’s just the way the timing worked out logistically. In order to camp without a permit the first night out of Waterton, we are aiming for a campsite about 16mi north of Waterton. To make that happen, we needed to do the out and back to touch the border from Waterton on a separate day. Since it is a weekend, we can’t send our resupplies or get our Canadian phone plans worked out until Monday. So, it worked to just get the miles in Sunday, take Monday to get errands and logistics done, and continue on hiking on Tuesday. Hope all that makes sense. We luxuriously slept in this morning (7am for me) and got a late checkout of noon while we each got our logistics worked out. For me, it was getting the blog in order and clearing out my inbox. Ah, feels so great to have that all done before we start! We were in Pincher Creek, 30mins north of Waterton, because it was a relatively larger town (still small) that had a Walmart for SIM cards, library, banks, larger Post Office, and the phone store to work out some other phone logistics. It’s really convenient that I was able to drive my own car up to have for all of this running around too. We left the motel and headed to the Post Office. 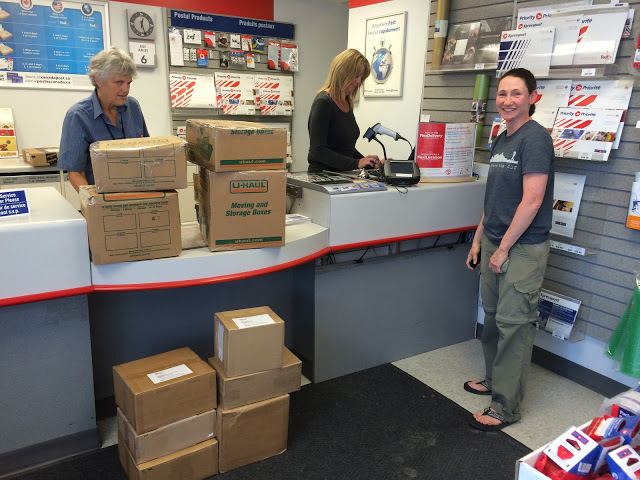 We each had six resupply boxes to mail and had heard that the Canada Post can take weeks to deliver. Expecting the worst, we were gleefully surprised to be greeted by the kindest and most cheerful postal staff I’ve ever met! The next big hurdle of the day was the phones, ugh… Obviously, I personally want the works! I doubt I’ll get much service and expect much of my data to be off wifi, but I have hope it could be better and don’t want to be limited by a crummy plan. The strategy is to get a Canadian SIM card, which can be purchased at the Walmart or local phone store here, and that will give us each a Canadian phone number. Then there are plans that you can get from a variety of providers that also use the bigger networks (Koodo, Chatr, Fido, etc…) Everyone says to get Telus and it gives me a headache to think about all the options and fine print of the pay as you go plans. E doesn’t use much, so she got a SIM card and bought a plan with Chatr (Koodo was preferred, but not available in Pincher Creek). 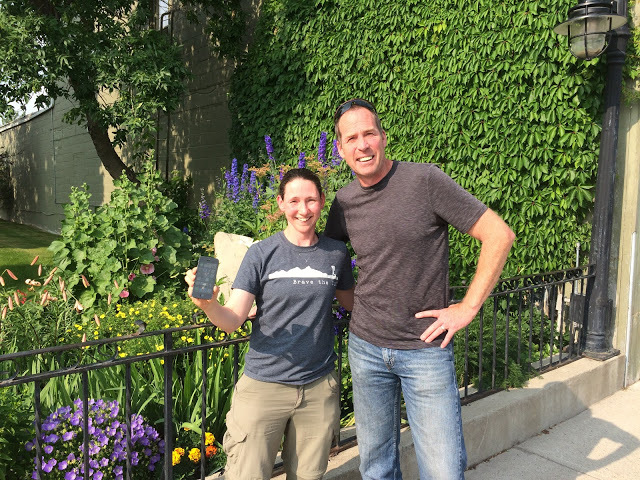 I did some research a couple weeks ago to find out that if I wanted a full on Telus plan that gave me pretty much unlimited everything (it’s the data that makes the difference from the other plans), I would have to be a Canadian citizen…or know a Canadian willing to put me on their plan…this is where my new friend Dave comes into the picture! Super Dave keeping Wired connected! Dave is the Chair of the GDTA and has been section hiking the PCT. He lives in Calgary and contacted me awhile back offering to be of service in this transition time as a trail angel of sorts. He said he’s had so much kindness from people along his PCT hike that he wants to do the same here when he can. So nice! Dave was able to add me to his family’s Telus plan and I just paid him directly rather than paying Telus. To do that, we had to go to the store together in Pincher Creek. He kindly drove over from Calgary to make this happen. So nice! The plan is already paying off tonight. 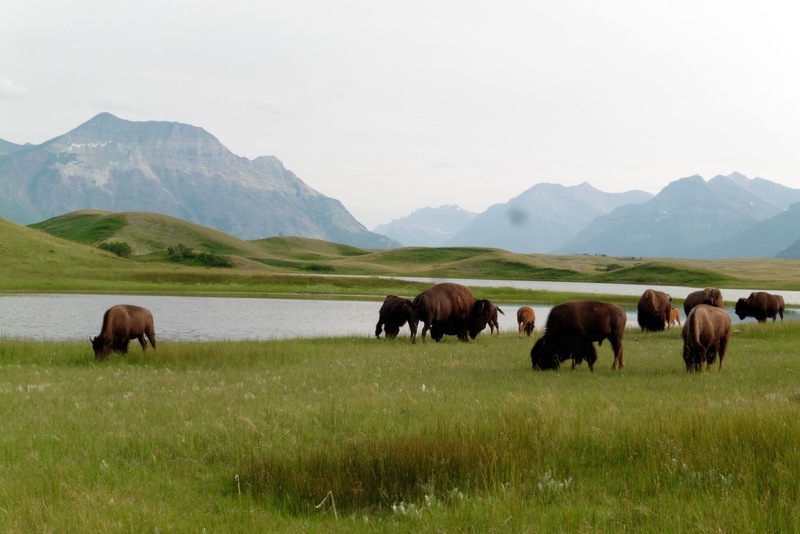 The wifi in Waterton is too weak to do a lot, so I’ve been able to come off it and just use the Telus connection and that has worked much better. E’s plan has turned out to have hidden costs and had some tricky wording that makes you think you’re getting more than you really do. For her, it will be rarely used, but it is something to really look into the fine print before choosing a plan. It does seem to be that you get what you pay for and if it’s cheap, there may be a reason for that. THANK YOU to Dave for making this happen!!! All the blog followers thank you too as this will help me to get the blog posts up more easily. 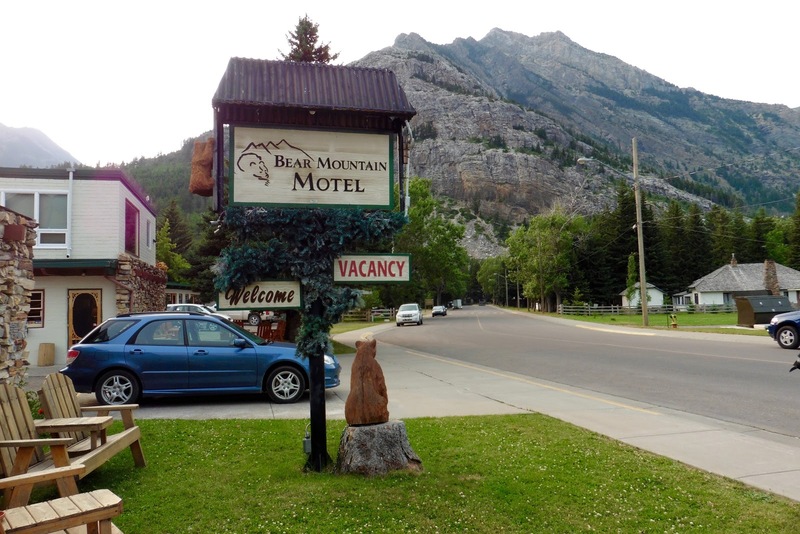 After we finished up all the errands, we headed back to Bear Mtn Motel in Waterton for our final night before hiking north. Just north of the park is a Bison viewing area that Zdenek recommended. Yep, really cool! It was an enclosed area and felt a bit like a zoo in that way, but man, what a scene! I’m a big fan of Waterton. Just a nice quiet small village of sorts that I find really calming and peacful. It is almost completely surrounded by mountains and really awe inspiring in any direction. Our affordable and quaint Motel for the night in Waterton. 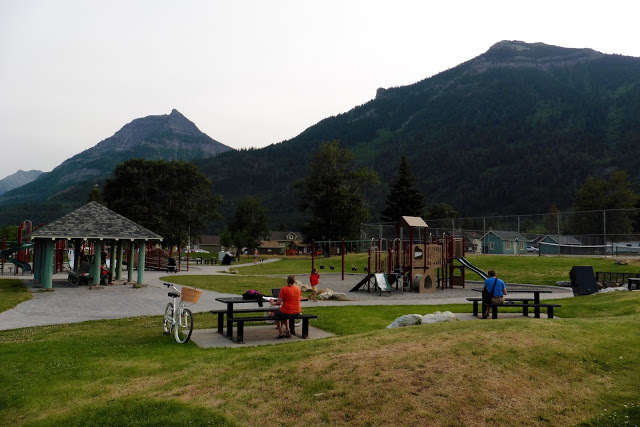 Two things here…a playground surrounded by massive mountains…and free town-wide wifi (woman in orange)! Many of you may wonder what I plan to do with my car while I’m hiking. Well, I totally lucked out and all has fallen into place! An awesome couple that follows the blog up in Prince George has offered to pick us up at our endpoint at the remote Kakwa Lake at the end of the trail. Then I will fly to Chicago, hopefully in time for the birth of my twin sister’s third son. From there, I will fly back to Portland. That means my car needs to find its way home to Portland from Waterton. Since the CDT ends here, I was able to put out a notice with this year’s CDT Class and got many responses of fellow hikers willing to drive my car back to Portland when they finished. One hiker, named Wide Angle, who I’ve known through the interwebs for a couple years, is finishing in a week or so and will be driving it back to Portland. So great! Until then, I made some calls to local agencies and found someone willing to hold the car until Wide Angle arrives. I just love how it all falls into place. So that’s just a small window into all the logistics for getting on trail. I know you must be worn out just reading about it. Now imagine figuring it all out in addition to the logistics of the other trails I’ve been on. I’m really thankful to E for pairing up on this one and she was a huge partner in the planning of this hike. It’s been tiring, and I’m just happy that with this trail, I have no more logistics of another trail to worry about afterward. All of this and I haven’t even mentioned the maps and navigation aspect of this trail. I will say that both the GDTA and Zdenek’s blog, which I referenced last post, are great places to find all that information. I’ll elaborate more on the maps and tracks as I hike, but it is a combination from A LOT of sources and it will be interesting to see which ones I end up using more than others. Ok, tomorrow is the big day! We have a 5 night leg ahead to get to Coleman and I may not get service before then, so no worries if I don’t post. I will get them posted as soon as I can get service.